A new Chinese language documentary series co-produced by Tencent Video and Japan's NHK, 72 Hours China, turned heads at the recently concluded World Congress of Science & Factual Producers in Australia, which ran from November 27 to 30. The collaboration between China's leading streaming site and Japan's documentary giant received the Highest Quality Documentary 2018 recommendation in the event's What's The Buzz section, which focuses on cutting-edge creators, producers, broadcasters and distributors working on science, history and non-fiction media. The new series, which debuted on Tencent Video in June, is an adaptation of the long-running Japanese series that explores people's lives in a certain locale over three days. Each of the 13 25-minute-long episodes were shot in a different city in China, from major metropolises like Beijing and Shanghai to little known or hard to reach places such as Yingxiu, a town in Southwest China's Sichuan Province that was hit hard by the 2008 Sichuan Earthquake, and a tent inn on Mount Qomolangma, known in the West as Mount Everest. 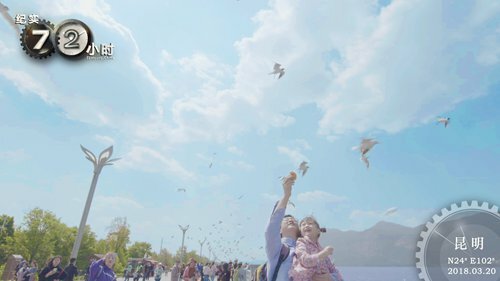 One episode about Zhejiang Province's Hengdian, one of China's biggest TV and film production centers, delves into the aspirations of thousands of people who are chasing their movie dreams by playing extras in films and TV shows. Li Nan, a 63-year-old who came to the city in the hopes of breaking into show biz, noted in the documentary that age is not a barrier when it comes to dreaming about making it big in Hengdian. Although some netizens have been critical of the Chinese version, saying that it doesn't live up to the Japanese original, the acknowledgement from the international professional community at the Australian event is a great win for Chinese professionals looking to tell China's story. "If you can find one or two stories you can resonate with, then you will discover that, in all the world, you are not alone and that there is someone out there that feels as you do," the producer Li Jie said, when discussing the series' success. According to a statement from the judges panel, Tencent Video's success with the show, especially among younger audiences, comes down to their use of big data to tailor content to viewers' preferences. According to a press release from Tencent Video, the first season of 72 Hours China has been viewed more than 240 million times. Production on the second season has already begun, but a release date has yet to be announced.